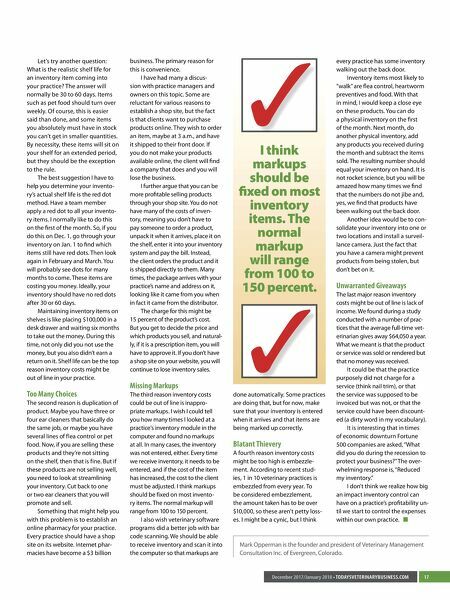 17 December 2017/January 2018 • TODAYSVETERINARYBUSINESS.COM Let's try another question: What is the realistic shelf life for an inventory item coming into your practice? The answer will normally be 30 to 60 days. Items such as pet food should turn over weekly. Of course, this is easier said than done, and some items you absolutely must have in stock you can't get in smaller quantities. By necessity, these items will sit on your shelf for an extended period, but they should be the exception to the rule. The best suggestion I have to help you determine your invento- ry's actual shelf life is the red dot method. Have a team member apply a red dot to all your invento- ry items. I normally like to do this on the first of the month. So, if you do this on Dec. 1, go through your inventory on Jan. 1 to find which items still have red dots. Then look again in February and March. You will probably see dots for many months to come. These items are costing you money. Ideally, your inventory should have no red dots after 30 or 60 days. Maintaining inventory items on shelves is like placing $100,000 in a desk drawer and waiting six months to take out the money. During this time, not only did you not use the money, but you also didn't earn a return on it. 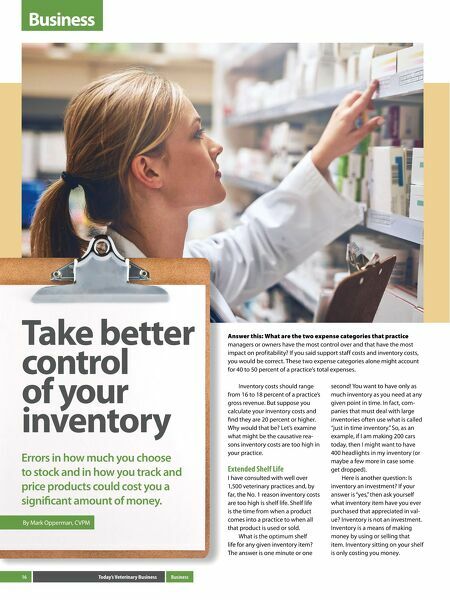 Shelf life can be the top reason inventory costs might be out of line in your practice. Too Many Choices The second reason is duplication of product. Maybe you have three or four ear cleaners that basically do the same job, or maybe you have several lines of flea control or pet food. Now, if you are selling these products and they're not sitting on the shelf, then that is fine. But if these products are not selling well, you need to look at streamlining your inventory. Cut back to one or two ear cleaners that you will promote and sell. Something that might help you with this problem is to establish an online pharmacy for your practice. Every practice should have a shop site on its website. Internet phar- macies have become a $3 billion business. The primary reason for this is convenience. I have had many a discus- sion with practice managers and owners on this topic. Some are reluctant for various reasons to establish a shop site, but the fact is that clients want to purchase products online. They wish to order an item, maybe at 3 a.m., and have it shipped to their front door. If you do not make your products available online, the client will find a company that does and you will lose the business. I further argue that you can be more profitable selling products through your shop site. You do not have many of the costs of inven- tory, meaning you don't have to pay someone to order a product, unpack it when it arrives, place it on the shelf, enter it into your inventory system and pay the bill. Instead, the client orders the product and it is shipped directly to them. Many times, the package arrives with your practice's name and address on it, looking like it came from you when in fact it came from the distributor. The charge for this might be 15 percent of the product's cost. But you get to decide the price and which products you sell, and natural- ly, if it is a prescription item, you will have to approve it. If you don't have a shop site on your website, you will continue to lose inventory sales. Missing Markups The third reason inventory costs could be out of line is inappro- priate markups. I wish I could tell you how many times I looked at a practice's inventory module in the computer and found no markups at all. In many cases, the inventory was not entered, either. Every time we receive inventory, it needs to be entered, and if the cost of the item has increased, the cost to the client must be adjusted. I think markups should be fixed on most invento- ry items. The normal markup will range from 100 to 150 percent. I also wish veterinary software programs did a better job with bar code scanning. We should be able to receive inventory and scan it into the computer so that markups are done automatically. Some practices are doing that, but for now, make sure that your inventory is entered when it arrives and that items are being marked up correctly. Blatant Thievery A fourth reason inventory costs might be too high is embezzle- ment. According to recent stud- ies, 1 in 10 veterinary practices is embezzled from every year. To be considered embezzlement, the amount taken has to be over $10,000, so these aren't petty loss- es. I might be a cynic, but I think every practice has some inventory walking out the back door. Inventory items most likely to "walk" are flea control, heartworm preventives and food. With that in mind, I would keep a close eye on these products. You can do a physical inventory on the first of the month. Next month, do another physical inventory, add any products you received during the month and subtract the items sold. The resulting number should equal your inventory on hand. It is not rocket science, but you will be amazed how many times we find that the numbers do not jibe and, yes, we find that products have been walking out the back door. Another idea would be to con- solidate your inventory into one or two locations and install a surveil- lance camera. Just the fact that you have a camera might prevent products from being stolen, but don't bet on it. Unwarranted Giveaways The last major reason inventory costs might be out of line is lack of income. We found during a study conducted with a number of prac- tices that the average full-time vet- erinarian gives away $64,050 a year. What we meant is that the product or service was sold or rendered but that no money was received. It could be that the practice purposely did not charge for a service (think nail trim), or that the service was supposed to be invoiced but was not, or that the service could have been discount- ed (a dirty word in my vocabulary). It is interesting that in times of economic downturn Fortune 500 companies are asked, "What did you do during the recession to protect your business?" The over- whelming response is, "Reduced my inventory." I don't think we realize how big an impact inventory control can have on a practice's profitability un - til we start to control the expenses within our own practice. Mark Opperman is the founder and president of Veterinary Management Consultation Inc. of Evergreen, Colorado. I think markups should be fixed on most inventory items. The normal markup will range from 100 to 150 percent.